Capital Refractories are now able to offer an extensive series of gas diffuser products for the treatment of melts across a range hot metal industries. Gas purging homogenises the melt and can contribute to the purification of the alloy. Homogenisation aims for equalisation of the analysis and temperature of the metal in the vessel. Gas purging can effect rapid distribution and dissolution of alloying and deoxidising agents and quick adjustent of casting temperature can be achieved. Reduction of deleterious gas content and separation of non - metallic inclusions,with subsequent improvement in metal quality resulting from their elimination from the melt. 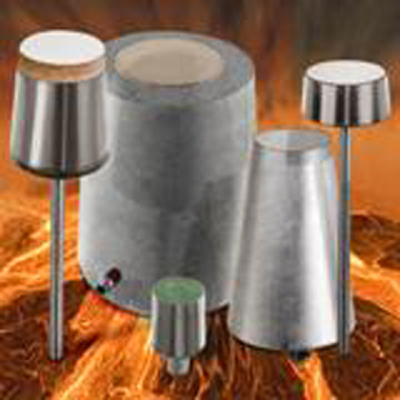 All Capital Refractories gas diffusers are supplied to suit the customers' requirements with respect to the metal casings and gas feed pipe work, the choice of these being dictated by the application, this being particularly important in aluminium melt applications if there is the posssibility of chlorine being used as a purging gas. Capital Refractories are able to offer a range of gas diffuser products for the treatment of metals in a wide range of furnace sizes. Gas diffusers for use in induction furnaces are available in a range of qualities, sizes and fittings. The choice depends on the lining thickness. The standard range for induction furnaces is made with Caperdiff 94 AL (a high alumina quality) and stainless steel cans and are usually available from stock (except IF 6). * The name: IF refers to induction furnace and the number is the nominal size in inches. To avoid confusion it is recommended to include the drawing number on any order. The quality of the plug depends on the application.